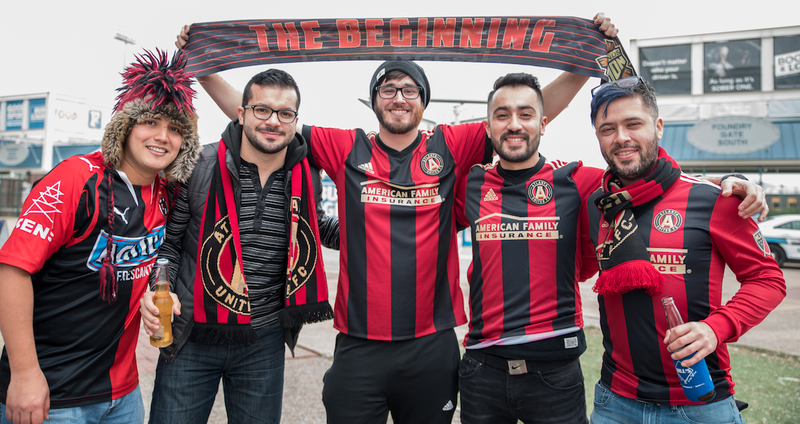 Atlantic Station is the place to be for Atlanta United’s inaugural season. While the city awaits completion of Mercedes-Benz Stadium, the first eight home games will be played at Georgia Tech’s Bobby Dodd Stadium. So our friends at AS are making fan transportation to the stadium easy by offering a FREE shuttle service. The shuttle, which will run on a 15-minute loop beginning two hours prior to kickoff and one hour after the match ends, will pick up fans in front of Regal Cinemas. Atlantic Station has over 7,500 parking spaces in the parking deck, so finding somewhere to park is easy and as always, the first two hours of parking are free. Also, be sure to ask your shuttle driver or the Concierge for “Show Your Ticket and Save” deals throughout Atlantic Station. Can’t make the game? Don’t worry. Meehan’s, Atlantic Station’s authentic Irish eatery, is the city’s premier destination to watch all of Atlanta United’s 15 nationally televised games, including the March 5 inaugural game against New York Red Bulls. Fans can enjoy the home team’s matches while savoring a full menu of classic Irish dishes elevated to the gourmet level. Other Atlantic Station restaurants also offer viewing options, including Yard House, where fans can experience the games on one of 30 televisions while enjoying the high-end sports bar atmosphere, huge menu of new American fare and an extensive draft beer list, and at Atlantic Grill, which offers traditional sports bar fare. Regardless of if you attend the games in person or watch at an Atlantic Station restaurant, make sure and stop by the official team store on Atlantic Drive for all your United merchandise, from t-shirts and jerseys, to headwear and novelties. The store is open Monday through Saturday from 10:00 a.m. to 9:00 p.m., and Sunday from noon to 6:00 p.m.
March 5: v. NY Red Bulls; kickoff at 7 p.m.
March 18: v. Chicago Fire; kickoff at 4 p.m.
April 30: v. D.C. United; kickoff at 3 p.m.
May 20: v. Houston Dynamo; kickoff at 7 p.m.
May 28: v. NY City FC; kickoff at 5 p.m.
June 17: v. Columbus Crew SC; kickoff at 7 p.m.
June 24: v. Colorado Rapids; kickoff at 7 p.m.
July 4: v. San Jose Earthquakes; kickoff at 7 p.m.